For more detailed information, check out the course proposal form. Tuesdays - 09:40 to 12:30 in BMB-5. and lear to apply theory on practical real-life geometric problems such as robot motion planning and location a point on a map. No formal prerequisites. However, students are expected to know fundamental data structures (CENG 213) and design and analysis of algorithms (CENG 315). M. de Berg, M. van Kreveld, M. Overmars, O. Schwarzkoph, "Computational Geometry: Algorithms and Applications, 3rd edition," Springer, 2008, ISBN: 978-3-642-09681-5. 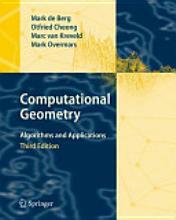 Computational Geometry Algorithms Library. CGAL-3.8. http://www.cgal.org , 2011.